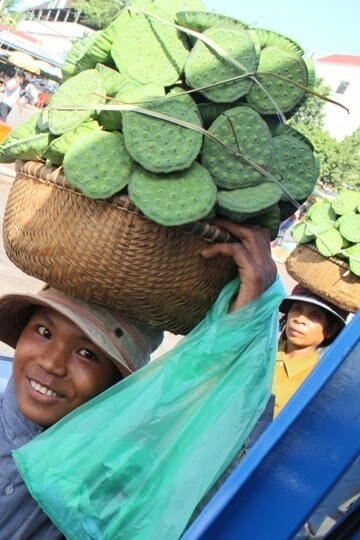 It must have been lotus season in Cambodia because people were selling them everywhere as snacks. These women were hawking them outside our bus at the Cambodia-Vietnam border. To eat them, you have to rip open the fibrous flower head. 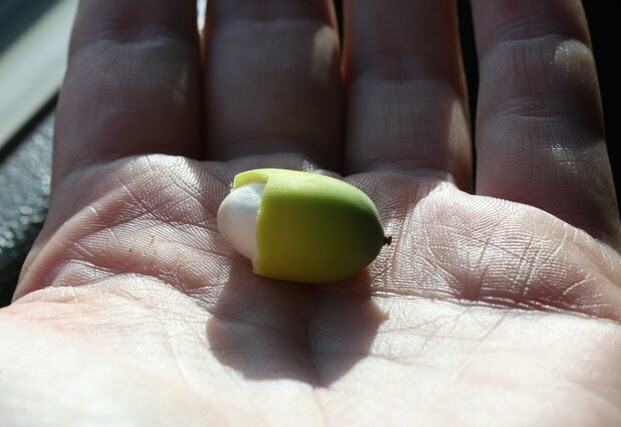 Then you peel off the seed’s little green jacket. 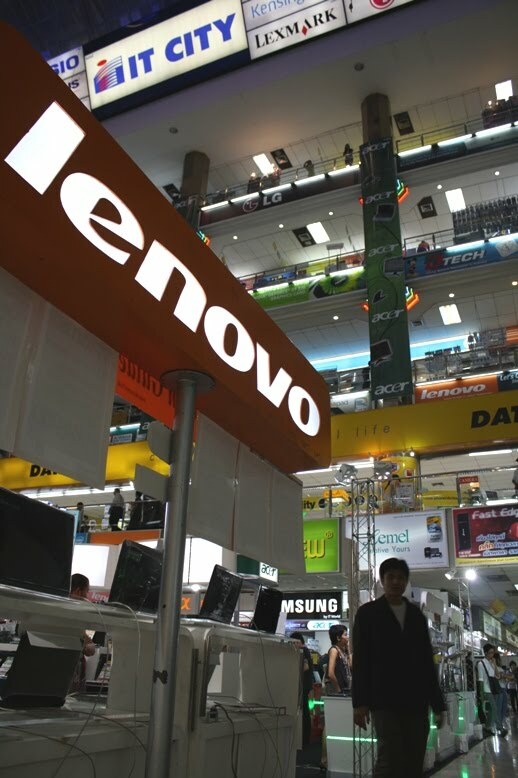 You’re left with a pure-white rounded cylinder that looks like a little pill or maybe an earplug. 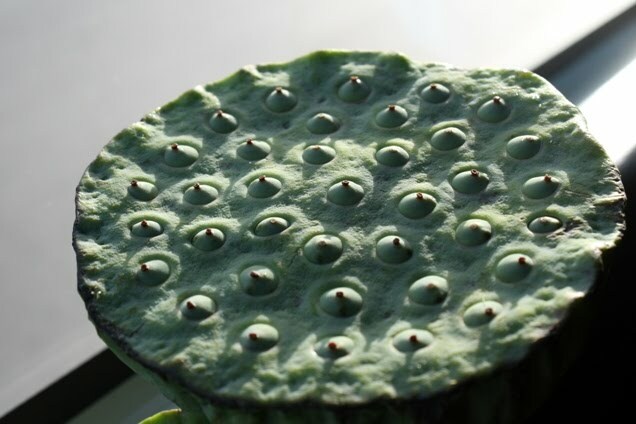 They have a slightly foam-like texture, like a mushroom but crunchier, and a mild planty taste like cucumber. 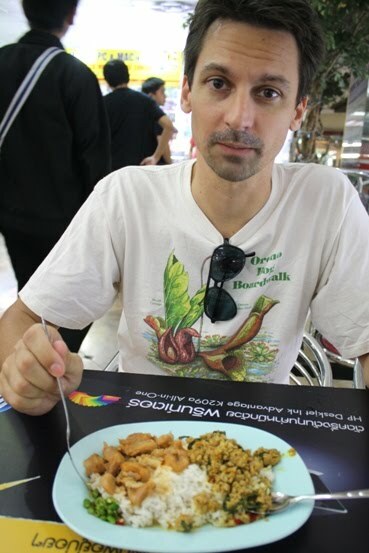 It wasn’t my favorite snack ever (I think that would still be the glorious curry puff), but it was fun to try, given the importance of the lotus to Asian culture and religion — and the number of lotus statues, bas-reliefs and paintings we’ve seen over the last few weeks. We didn’t do a lot of touristy stuff in Udon Thani, but we did make it out to one remarkable place: the Ban Chiang archeological site, about an hour west of downtown. The people of Ban Chiang produced distinctive red-patterned ceramics. 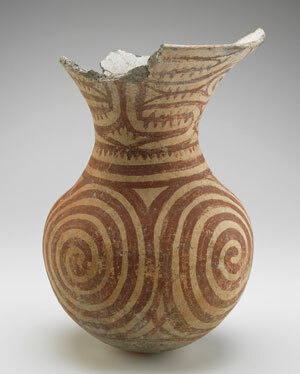 In fact, it was the pots working their way to the surface, like flags of an underground nation, that alerted a grad student to the presence of an ancient settlement in the late 1960s. 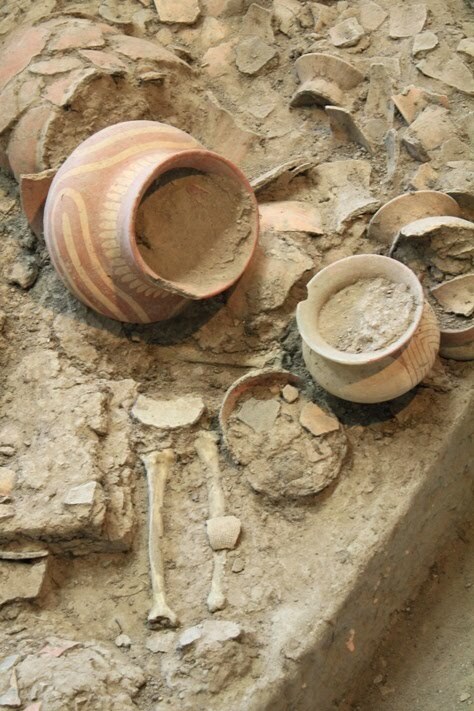 The people of Ban Chiang scattered pots over the bodies as part of their burial ritual. 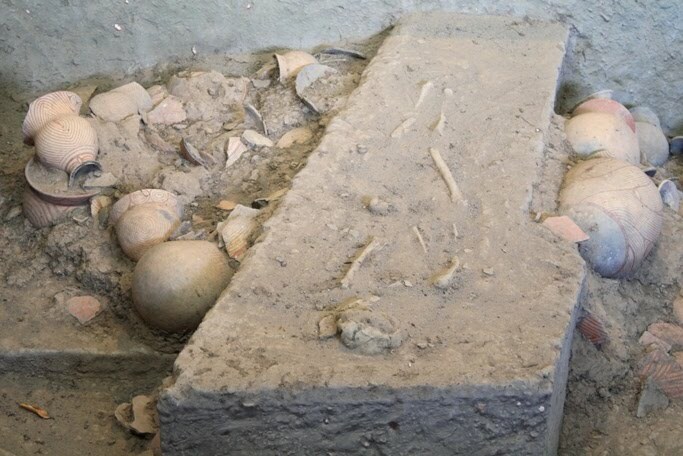 The earliest graves are believed to date back to 2100 BC. They suggest that Southeast Asia, previously thought to be a bit sluggish at developing Bronze Age tools, actually reached that landmark at a pretty respectable pace. Afterward we walked around the little town with our heads full of bones. 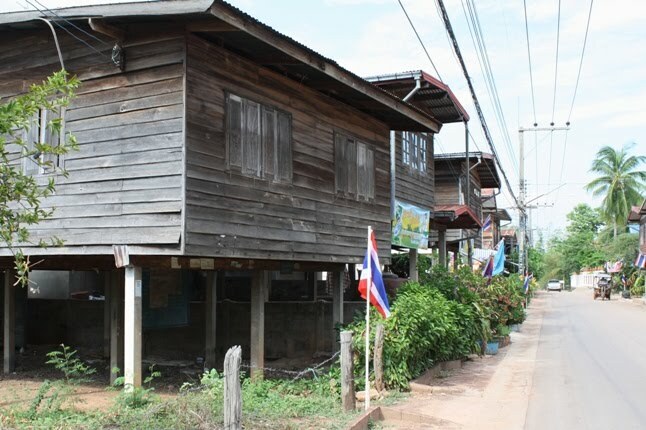 Lots of Ban Chiang houses are on stilts, making them look a bit like Maine or North Carolina beach houses, which added to the pleasant jumble of continents and millennia in my brain. 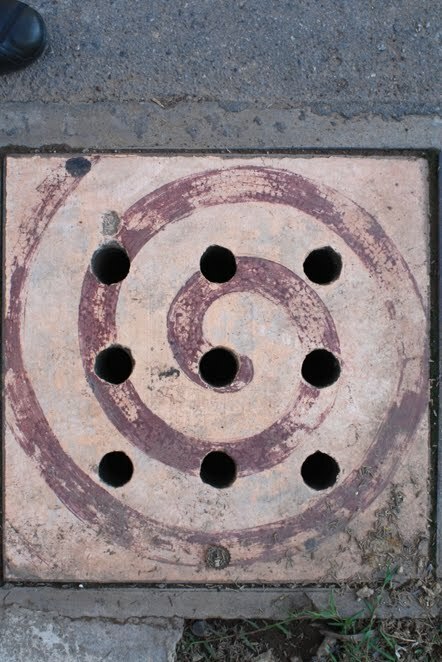 All the manhole covers in town are painted with patterns from the ancient pottery, which is a nice touch. 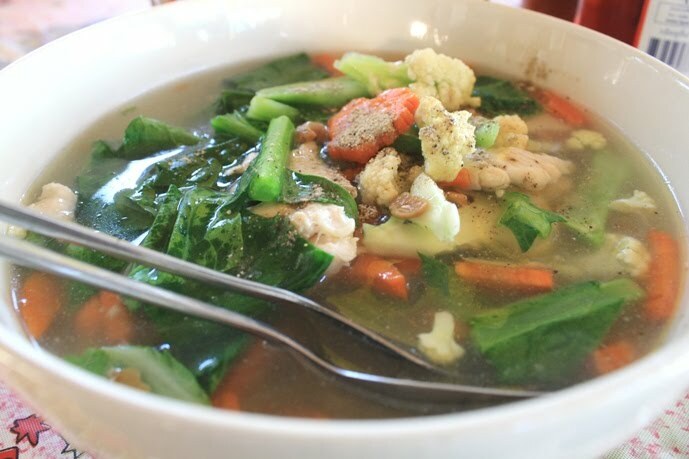 Lunch was a bowl of vegetable soup with wide, fried noodles at the bottom. It wasn’t spicy, but the accompanying jar of chopped chilis in vinegar certainly was! I’ve seen a lot of things roasted on sticks since I’ve been in Southeast Asia: chicken intestines, bugs, whole squid, etc. But eggs, complete with the shell? That was a new one on me. 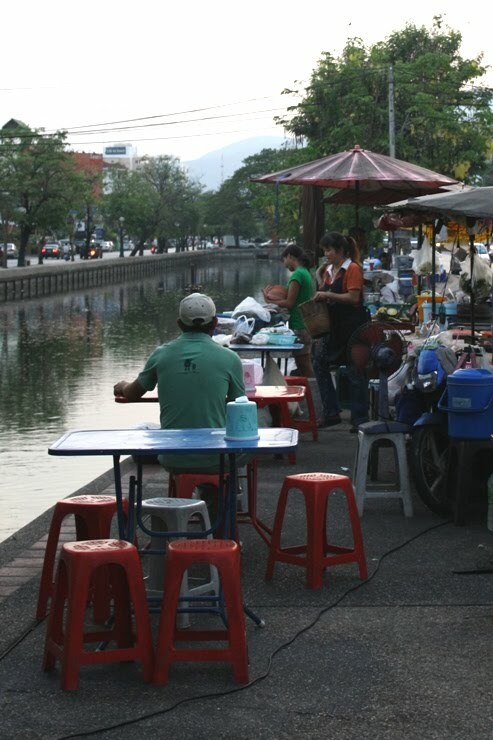 They were at the night market near Chiang Mai’s southern gate. Chad ate some porky Tom Yum soup, and I just got a soda water because I had an unhappy stomach. But we saw these as we were leaving, and with my love for hard-boiled eggs and my other love for things on sticks, I couldn’t pass them up. Back in our room (that’s our scratchy hotel blanket in the background), we peeled them cautiously. They turned out to be smoky-tasting, as you would expect, with a brownish-yellow hue and with a surprisingly velvety texture, like custard. 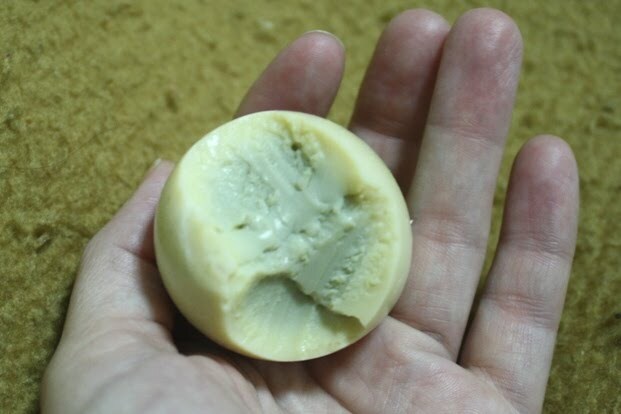 There seemed to be hardly any difference between the yolk and the white, as if they were dissolving into each other. 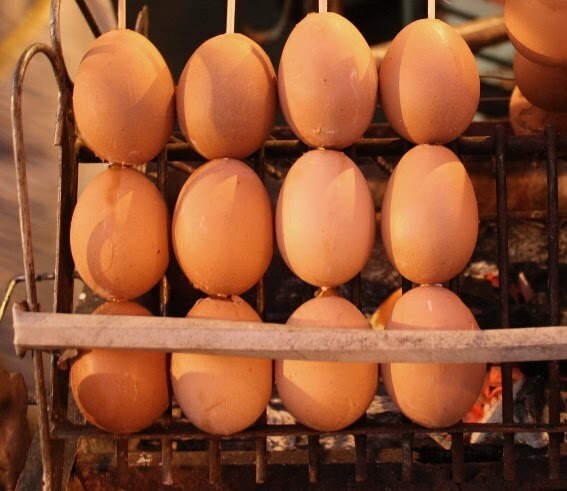 I figure the eggs must be boiled before roasting, but I’m still perplexed as to how they acquire that texture. A quick Google search yielded no answers. Anybody out there know? 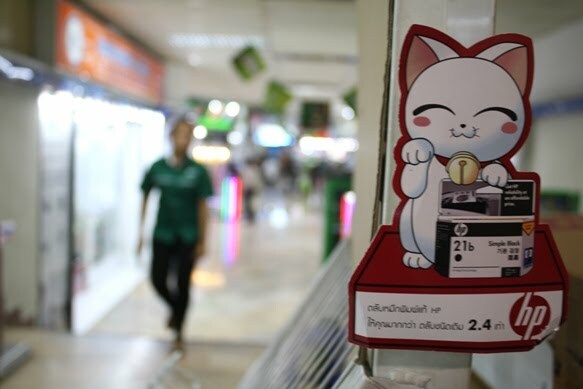 The Asian electronics supermall: it’s a place we’ve come to know well, whether it’s in Jakarta, Singapore, or in this case, Bangkok. It’s a beeping, blooping, blinking, booming and buzzing mountain of every high-tech toy you could need, and many you never will. Our errands there took about 11 times longer than we expected. Luckily there was a good food court on the second floor to collapse in. 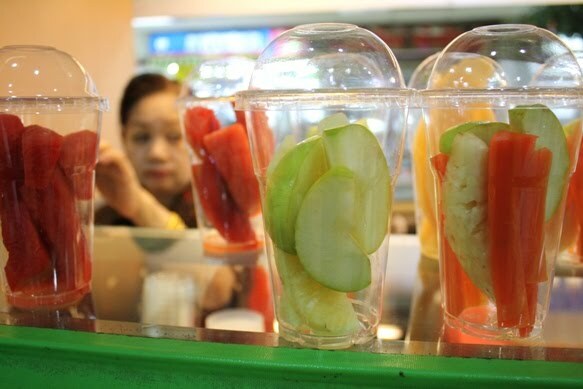 At the juice stand, you can pick a cup of fruits and vegetables and the woman will blenderize them for you with ice, sugar and a bit of water. Chad played the “Order what the guy in front of you ordered” game at the food counter. He must have been standing behind a pork lover, because we got a crumbled pork stir-fry and a side of braised pork, both pretty tasty. It’s too early to make a definitive judgment, but I would say Thai food shows happy signs of being, like Indonesian food, better as it gets cheaper. 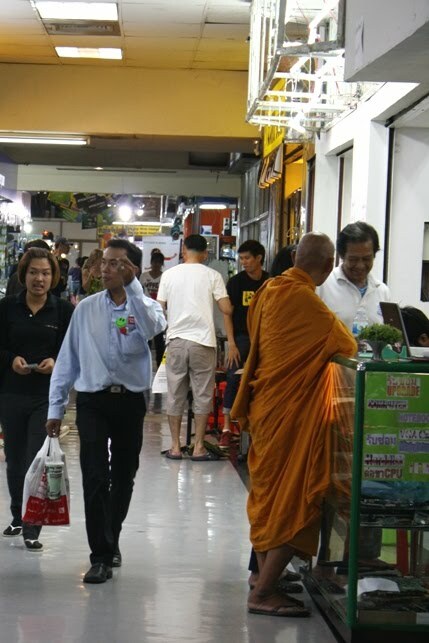 “You should probably ask before you take pictures of a monk,” said Chad. “But if he doesn’t see me, I don’t have to ask,” I countered. Chad is really a better person than me, when you get right down to it. “That stuff with the blood in it.” That’s what other Westerners warn you about if tell them you’re going to the Philippines. My boss went on at some length about a variety of blood-based dishes, until I began to wonder if any Filipino food didn’t have blood in it. 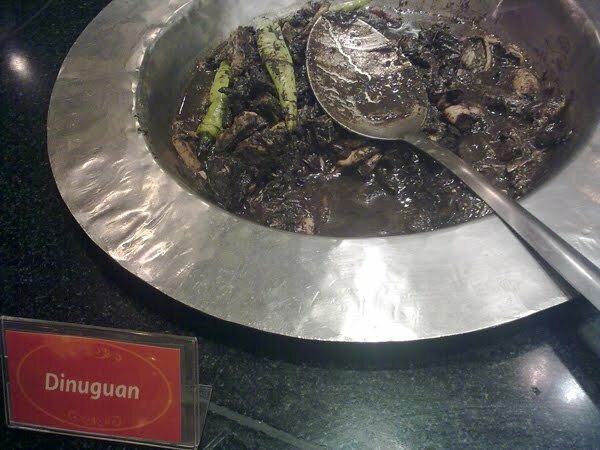 As it turns out, the dish is called Dinuguan, and it’s made out of pork. It was a thick stew, almost gel-like, with dark and meaty flavors and hints of chili and vinegar. It was tasty, though I confess the blood part did put me off a bit. 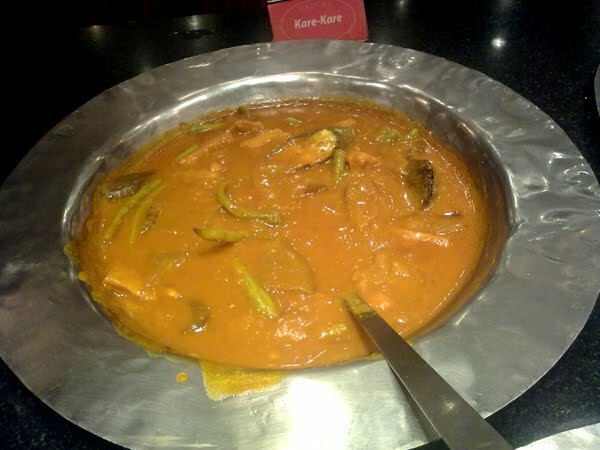 I expected Kare Kare to involve curry, but in fact it was a rich peanut stew with vegetables, kind of like an African groundnut stew. Yum! 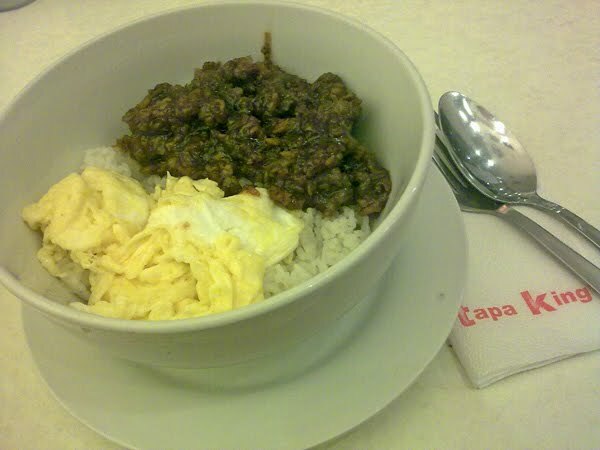 Filipino food relies less on chilis than Indonesian food. 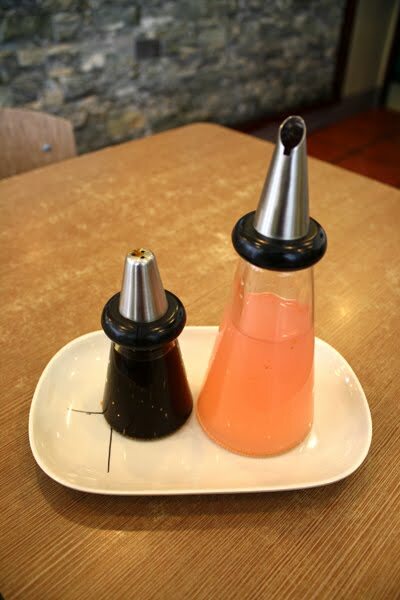 Instead of sambal, you’ll often get vinegar and soy sauce on the side. Vinegar and soy sauce went nicely with this cold half-eggplant with tomato and onion, which I got at a fast-food place. If only McD’s and Burger King served eggplant! 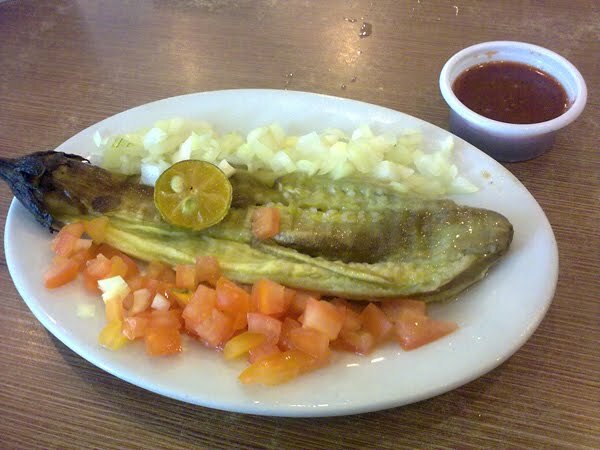 That’s a chili sauce on the side, by the way, although as I recall the emphasis was on musky, fermented-fishy flavors as much as on spicy heat. One problem with blogging too far after the fact is that the details get a bit foggy. I don’t remember what this dish was called, but I’m guessing it was a kind of tapa, which Wikipedia tells us is “a traditional dish of salt-cured beef that is similar to American-style beef jerky.” It certainly wasn’t that salty, but perhaps it was soaked before being cooked up in a sauce. It was a meaty, stick-to-your ribs kind of meal with scrambled egg and rice, served up at another little fast-food joint. 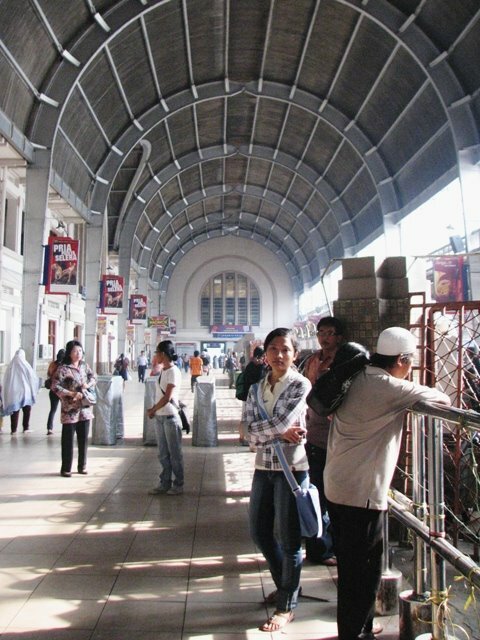 There’s a famous old train station in northern Jakarta that I’ve always admired from the bus window. Since I was being a transportation geek anyway, I figured I’d go have a look inside. Like so many buildings in Jakarta, Kota Station is blockaded by fences and barricades. It’s a bit of a chore to get in. But it’s worth the effort. It was built around 1870, with this really lovely vaulted ceiling. It’s still a working train station. The route map filled me with travel desires. 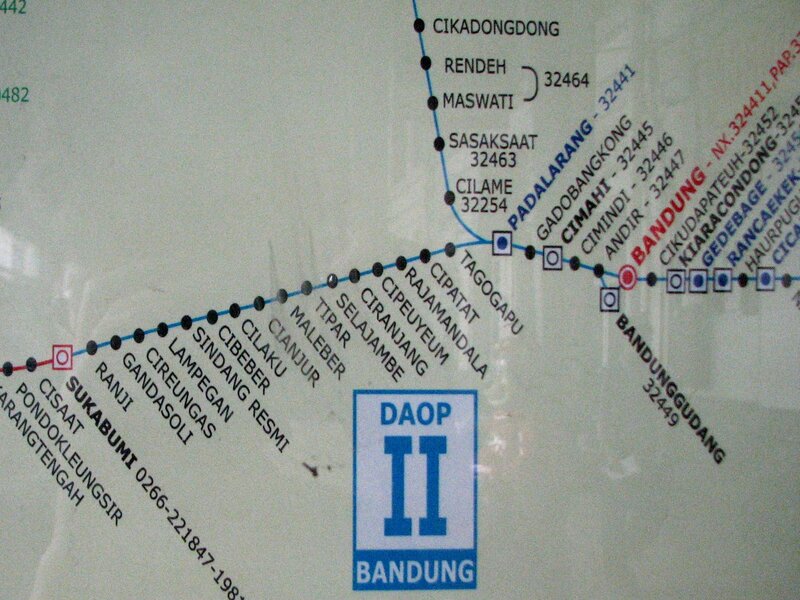 After all, who wouldn’t want to go to Cikadongdong, Gadobangkong or Tagogapu? Unfortunately, almost as soon as I got to the station my camera batteries died. I decided to walk down to the Glodok marketplace to buy more. On the way out I bought some lumpia from the Bicycling Lumpia Man. 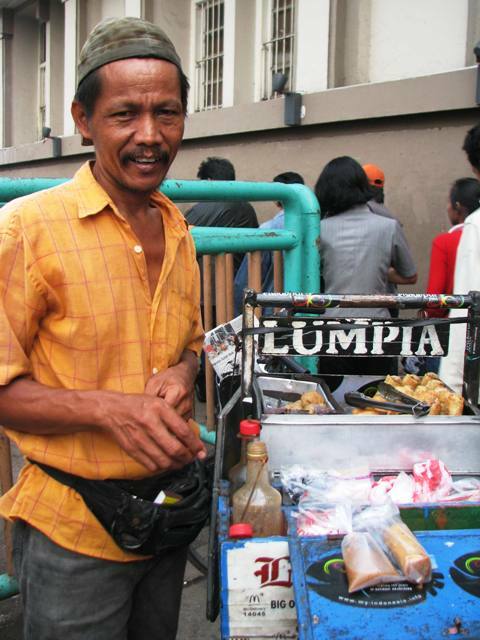 Lumpia are the Indonesian version of egg rolls. These ones were small, greasy and tasty. They came with a little baggie of sweet peanut sauce that seemed to proclaim: sure, this is a Chinese-derived snack in a Chinese part of town, but still, it is JAVANESE food. This summer, while transitioning between jobs, I had two glorious weeks off. 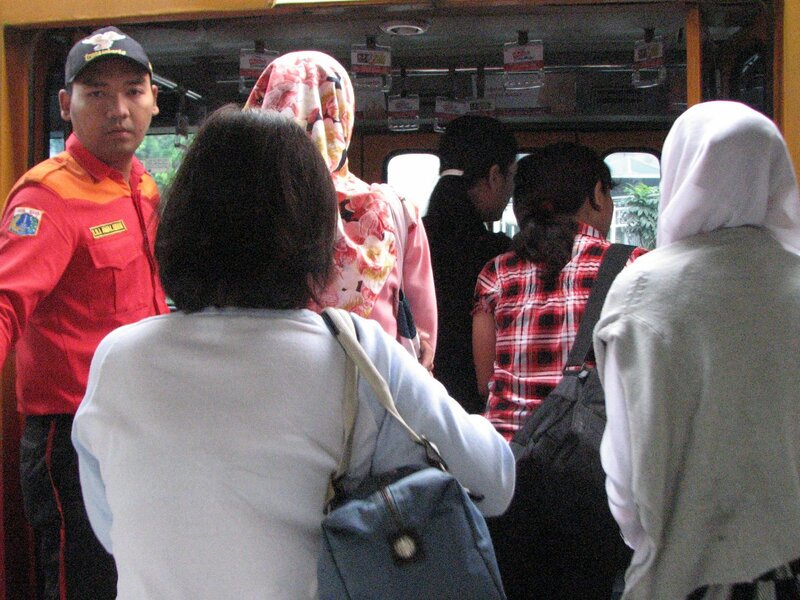 I decided spend one of these magical free days traversing Jakarta on the Busway. It seemed like a fun way to see parts of town I don’t normally get to. Plus, I actually thought I might be able to ride all the lines in one day, which turned out to be a pipe dream. I got to our local station, Benhill, at around 7 a.m. Things were hopping — lots of foot traffic, lots of road traffic. , The breakfast vendors were in full swing. 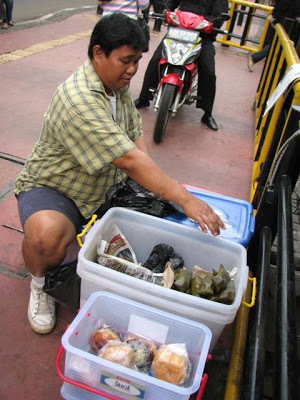 This guy is selling sticky rice wrapped in banana leaves, probably with a little chicken inside, as well as an assortment of pastries. These people start early — probably by 5, although I’ve never been around to see — and they’re usually gone before 9. Here’s another pastry basket. 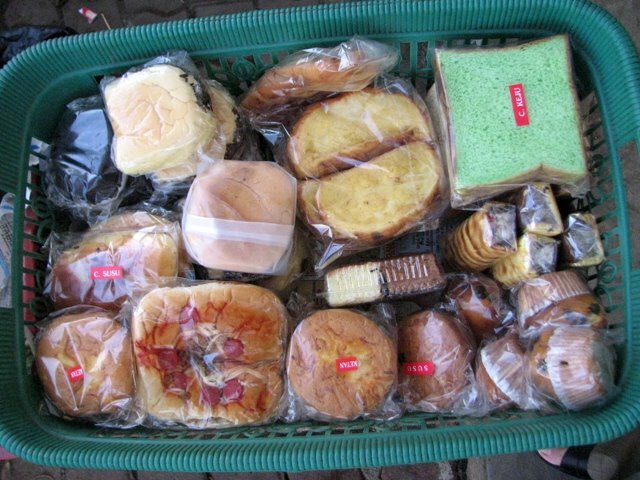 Don’t be alarmed by the green bread — it’s flavored with pandan, Indonesia’s answer to vanilla. The station wasn’t too crowded. I waited inside for about five minutes, thinking about the warning a taxi driver had given me a month or two before: Watch out for men in suits and jackets on the busway. They’ll hypnotize you and steal your wallet and cellphone! I saw some guys in business attire, but they seemed to be innocently reading the paper. Of course, that was probably their cover. Finally the bus came. I had decided to ride all the way up to the Chinese end of North Jakarta and then double back to get on one of the East-West lines. This was cheating, in a sense, since I’ve done the north-south trip many times … but I also know it’s the best line on the busway, and I wasn’t in a hurry to start dealing with long lines and packed buses. So I set off to Kota.